William Connolley wrote about this amazing discovery in an article with the title "Force X from outer space". So I figured I didn't have to. However now that Anthony Watts has decided to promote it, and with WUWT otherwise being so depressingly boring and predictable lately, here is your weekend entertainment. I don't know if the two David's and Jo have looked at whether this notch is only affecting Earth or whether there's a notch affecting the moon, Jupiter, Saturn, Venus, Mercury or Mars. Uranus may be too far away for them to bother with. As for the mysterious Force X, they claim they know not what it is. All they can say is that it comes from the sun - though the details are fuzzy at best and at times seem to be contradictory. Jo is being unusually generous with David Evan's Notch and Force X. She's giving it away for free. I wonder if that's because she's already got enough money from her very successful panhandling effort early in the year. Or maybe it's because she's not sure if she can even give her idea away. The discovery of Force X and the notch in the sun is doubtless making huge waves in the scientific community. Because I've not heard a whisper of it in the hallowed halls of academia I can only assume that all the climate scientists throughout the world are bunkered down, busy working out which discipline they are going to shift to, now that all of climate science has been explained by Force X and a Notch. The synopsis then is that solar irradiance (TSI) is a leading indicator of some other effect coming from the Sun after a delay of 11 years or so. The flickers in sunlight run a whole sunspot cycle ahead of some other force from the sun. Knowing that solar irradiance dropped suddenly from 2003 onwards tells us the rough timing of the fall in temperature that’s coming (just add a solar cycle length). What it doesn’t tell us is the amplitude — the size of the fall. That’s where the model may (or may not) tell us what we want to know. That test is coming, and very soon. This is an unusual time in the last 100 years where the forecasts from the CO2 driven models and the solar model diverge sharply. Oh the timing! Ponder how ambitious this simple model is — the complex GCM’s only aim to predict decadal trends, and have failed to even do that. Here is a smaller simpler model proffering up a prediction which is so much more specific. The Solar Model has not shown skill yet in predictions on such short time-scales, though it hindcasts reasonably well on the turning points and longer scales. It cannot predict ENSO events, and obviously not aerosols, nor volcanoes. But if the notch-delay theory is right, the big drop coming is larger than the short term noise. Science deniers think that mainstream science is a hoax but they'll buy a mathturbatory Notch and a mysterious undetectable Force X from the sun? It seems like a nice little lark they've got going. They beg for money and promise a special project, skim thousands from their readers, and come up with nothing more than "flickers in sunlight" and "some other force from the sun"! I wonder if anyone is looking at a "false pretences" claim? The reason for the cooling is the dramatic fall in solar radiation that started around 2004. 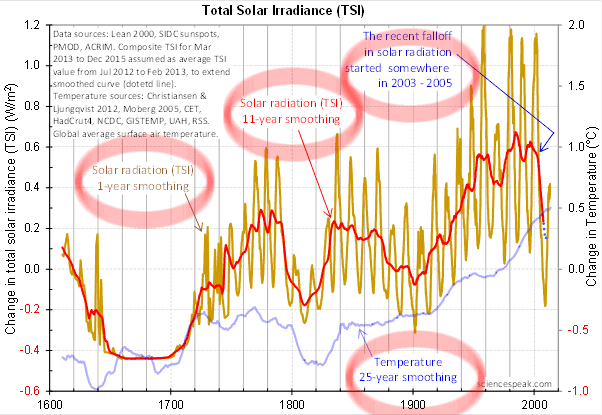 Here is a graph of solar radiation since 1610, when sunspots were first recorded. The brown line is the solar radiation, and it peaks every 11 years or so because of the sunspot cycle. We put an 11-year smoother through it to gave us the red line, which shows the trends in solar radiation. You'll notice the one year and eleven year smoothing of what they call TSI, (which isn't, going by the chart below). 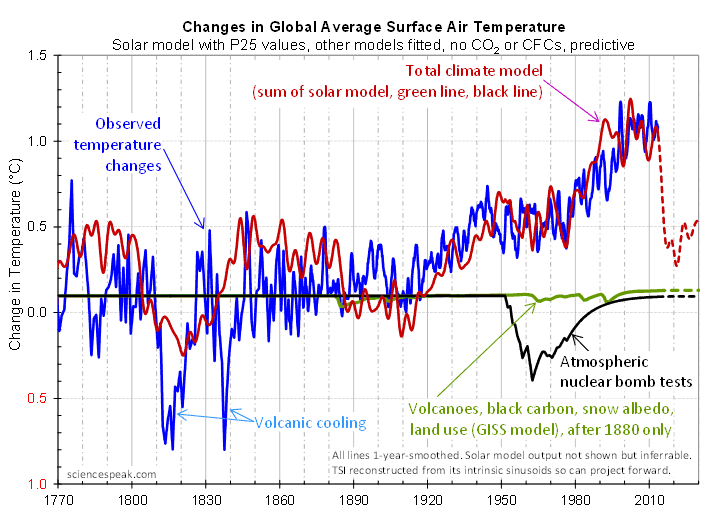 And the 25 year smoothing of the global temperature. (Why not eleven year smoothing, I hear you ask. And well you may.) From where they got global surface temperature going back to 1600 I don't know. They list numerous sources and call it "global average surface temperature", but they included UAH and RSS, which would probably be lower troposphere, not surface temperature. However the physical interpretation of the notch and delay (see Post IV) show that these little changes foretell the changes in a newly detected climate influence from the Sun, which we are calling “force X” for now. The effect on temperatures of changes in force X is 10 to 20 times as great as the immediate effect of changes in solar radiation (see Post VI). Force X works by modulating the albedo of the Earth, or the amount of solar radiation reflected straight back out to space without changing the heat of the planet, by clouds and ice and so on. Force X turns the tap that controls how much sunlight pours into the Earth’s climate system. This could be through UV, magnetic field effects, solar wind, or some form of electrical field. This mysterious and as yet undetected Force X is quite magical. It affects temperature ten to twenty times as much as does incoming solar radiation. (Notice again the wide range of possibilities.) Apparently Force X changes the albedo, whether all over the earth, or only the land or only the oceans David Evans doesn't say. Nor does he explain just how the reflectivity of the surface is changed. But however it works, it is a mighty big change. Oddly enough the magnitude of this Force X is apparently not that much smaller than that of the greenhouse effect. Another strange thing about Force X is that while it affects outgoing radiation, "modulating the albedo", at the same time if affects incoming radiation. It "controls how much sunlight pours into the Earths' climate system". And it could be through light itself (UV), through "magnetic field effects", through "solar wind" or as "some sort of electrical field" which is unknown and undetected. They forgot about the kitchen sink. Knowing that solar irradiance dropped suddenly from 2003 onwards tells us the rough timing of the fall in temperature that’s coming (just add a solar cycle length). If the temperature on Earth is entirely controlled by solar effects, the cooling will return us to the temperature levels of the 1950s or even the 1920s, undoing the last 50 or 100 years of global warming in just a few short years. 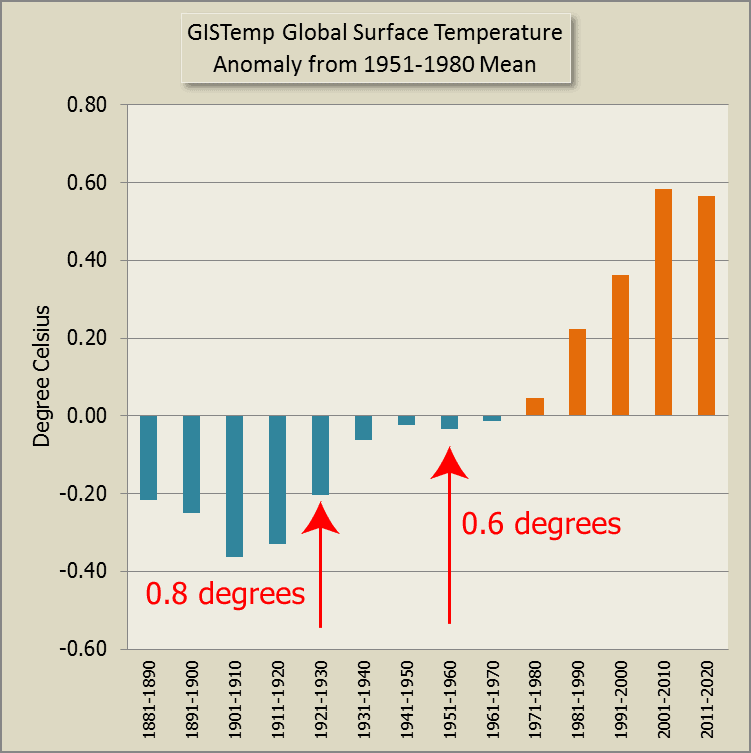 Here is a chart of decadal surface temperatures so you can see the prediction more easily. The latest decade is incomplete of course. At least a small portion of the recent global warming was due to rising carbon dioxide, so the fall will not be as large as shown in Figure 2. I guess they've still got a bit more work to do on their model. As we head to the UNFCCC meeting in Paris 2015 where global bureaucracy beckons, a sharp cooling change appears to be developing and set to hit in the next five years. I expect the hottest May on record was a spanner in the works. So they've decided their fudge factor might be sixteen years, not eleven years. Rather telling was their motivation, linking their fantastic fantasy to the climate conference next year. Here’s the criterion: A fall of at least 0.1°C (on a 1-year smoothed basis) in global average surface air temperature over the next decade. Wow. They've reduced their estimate from between 0.6°C and 0.8°C within a solar cycle starting this year, to 0.1°C in ten years. That's backtracking a whole heap more than their "small portion" is from CO2 comment would suggest. 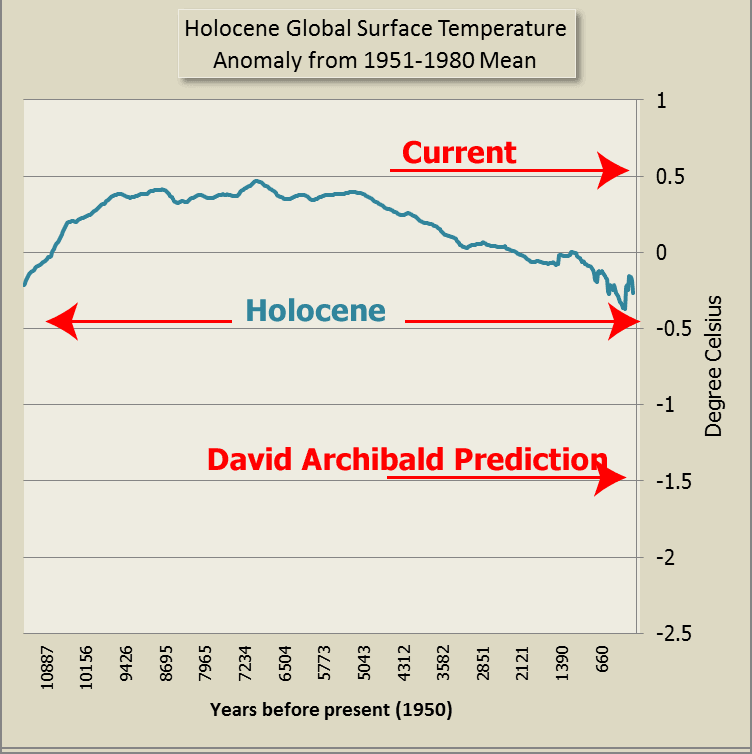 This time David is going even further and predicting a drop in temperature of 2°C. Now he's put up a chart of central England temperature so it's not clear whether he thinks that global surface temperatures are going to drop by 2°C or whether he's just predicting a big freeze in central England. In the past, David has used "five rural, continental US stations" of the USA as a proxy for global surface temperature. So my guess is he's predicting a drop in global surface temperature of 2°C. The comments below are to David Archibald's article at WUWT, which itself is supposedly based on Jo Nova and David Evans' Notch and Force X hypothesis. I think you are still right. Within 18 months, perhaps, but I’m still looking for 2015 as the start of cooling beyond ALL of the models. I don’t think the world will plunge into a Dalton, but your work has the advantage of strong observational evidence. Is TSI being considered as a driver here or as a chance correlate? There is a need to differentiate global temperatures from northern continental interior temperatures. What has happened to date suggests that global temperatures may fall only a few tenths, while northern continental interior temperatures may take a wallop. I thought the Maunder Minimum lasted from 1645~1715. Isn’t a 25yr lag a little too long after the fact? I could understand attributing causation had the great famine occurred during the Maunder, but a 25-year lag seems a bit of a stretch. 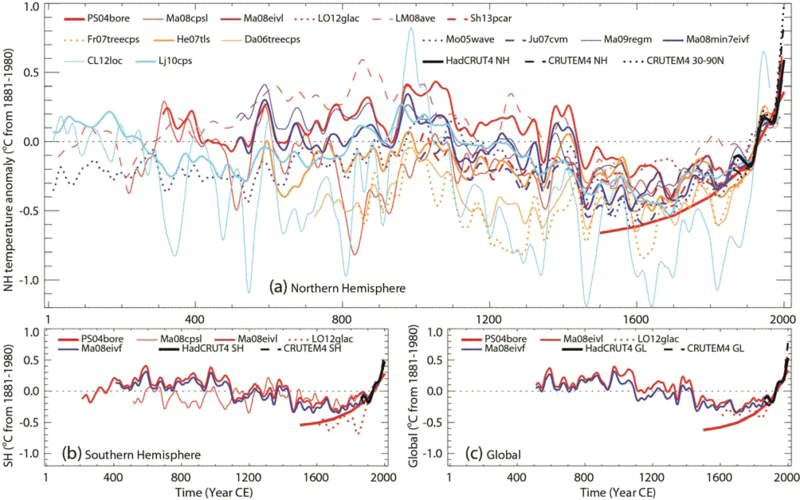 The CET record does, however, show considerable cooling during the Maunder Minimum. There is no such drop. If anything TSI is now higher than it were in 2003. As far as I am concerned, the model is already falsified. Not by the observations but by the [almost fraudulent - as there clearly is an agenda here] use of invalid input to begin with. This concludes my comments as the prediction is worthless on its face. II am extremely pleased to see that this information is started to be seen on other sites. I think of this hypothesis as the unifying theory of Climate Science. It is a bare bones hypothesis with falicification points. It needs inputs from others like yourself. Hopefully it will put the stake in the heart of CAGW. I have a very limited income and fuel, energy and food costs are killer for everyone. Excellent accurate information. Past history has shown us each and every time prolonged solar minimum conditions are present the temperature response has been down. One item that could slow down solar effects somewhat is ocean heat content. This has me confused. Total Solar Irradiance (TSI) varies from a smoothed high of 1366.5 W/m2 to a low of 1365.5, or +/- 0.5 W/m2. 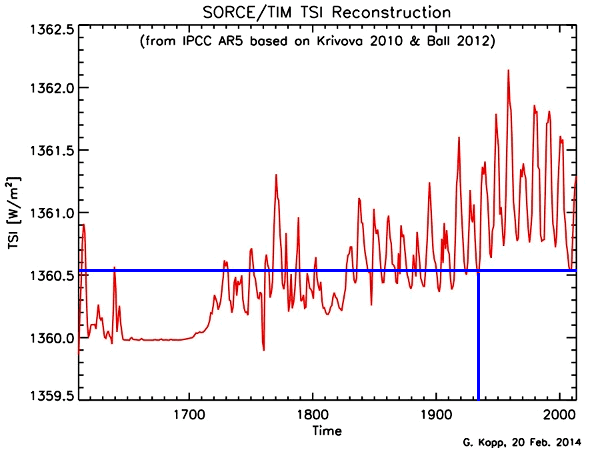 This represents a change of less than 0.04% in TSI over a complete solar cycle, i.e. 100*(0.5)/1366. This is responsible for climate changes of 0.5 deg C? If that is the case we never evolved because the earth is too sensitive to changes in TSI to support life. The story of Icarus from Greek mythology should be borne in mind by anyone trying to predict the climate by looking ONLY at the sun’s output. Also bear in mind the theories of next years harvest based on previous correlations with sacrificed goats. This article gives scepticism a bad name. I await the rest of David Evans conjecture. So far I like the roll out and approach. If the solar data used is rubbish and the land based temperature record as flawed as I believe, then there is also a chance the proposed model can be useful. G.I.G.O can produce weird truths. What I do admire is the process, soon enough all of the Australian Duo’s theory will be on line for all to see and assault. Maybe all this IS a Pons scheme. Force X? No, I think it must be those pesky Climate Elves. Everyone knows it takes Climate Elves 11 years to get to the Earth from the sun on Santa's sleigh. Erm .. how does this tripe vary from the slayer stuff that lukewarmer Watts doesn't allow on his scientific website? I am guessing that the predicted cooling will start after 2015 if thats when we have an El Nino, ie. be part of the "cooling since 2015", followed by "no warming since 2015", followed by "no statistically significant warming since 2015" cherrypicking after which point they move onto the next piece of BS that can be fitted mathematically to the data while having no physical basis. And, in the meantime, the planet gets warmer. Maybe force x is Tol's gremlins? Don't miss Monkers vs LS in the comments, with Lord M playing the role of Black Night. More seriously, I lose a bet I had with myself, which was that WUWT would ignore DE's theory. However, I think my basic reasoning was correct and AW has cunningly found a way to evade it. My reasoning (and its mine, therefore interesting, therefore I shall share it with you) was that AW wouldn't have a clue whether DE's stuff was right or wrong or not-even-wrong; and would therefore neither wish to praise or diss it, unless the status of the idea became clear on its own, just in case he picked the wrong side of the fence. However, JoNova has dropped a few hints that she isn't exactly happy with AW for ignoring her; and I doubt they want to fall out. So AW has got DA to post an "opinion piece", which is fine, as DA can be thrown under the bus later if desired. Meanwhile, LS has come close to calling the whole thing fraudulent, which is bad news for them as LS was one of the people whose opinion they wanted. Good point, William. Anthony probably is waiting to be told what to think. He's been burnt so often these past few months. Willis doesn't think much of it either. On a similar note, I see he's been told to kiss and make up with Steve Goddard and he has done so. Going overboard and giving the impression to most casual readers that Steve was right about his "fraudulent" accusation. Of course that's a pile of nonsense. Anthony's article was also making a mountain out of a molehill and grandstanding to the ultimate. It's a prelude to his not-yet-published-if-ever "paper". Nick Stokes pulled Anthony up a few times and all that happened was that Anthony showed his ignorance about the subject (and his dislike of anything Nick has to say). Anthony came out of it looking stupid to most thinking people but looking like a hero to his denier fans. That would make it a win in Anthony's little mind. Because the deniers must always downplay, I suppose. So it doesn't look too scary to their audience. So what's that all about? How can you take a figure of 0.168C (from Levitus et.al 2009, expressed as a total change in ocean mean volume temp from 1955 - 2008), and divide it by 15.913 (x 10 ^ 22 joules), which is how much we've warmed the oceans from 1955 - 2008, to arrive at any kind of meaningful figure?! Just what *are* the units then? Now I might be wrong on this, but if I am, please show me your work. And if David Evans is making any sense I might just decide to retire from reality as a result. Did he mean to express the change in ocean mean volume temp as a number per year? If so, why not divide it by the number of years? (2008 minus 1955). That would have made it even scarier than 0.0106 deg C! According to me, this is not only mathturbation, but mathturbation that is full of whopping big mistakes. Sorry, but to be more succinct... a figure of 0.168 deg C expressed as a *change in ocean mean volume temp from 1955 - 2008 in the 0 - 700m layer* is already what it is. How can you divide it by anything, unless you want to express it as a change/year? Easy. You just do it, and assume nobody is going to call you on it. That mysterous Force X that mimics the effects of a mysterious gas that would let inwards visible radiation pass, and block part of the outwards infrared radiation! If such gas existed, it would certainly have been detected by now. And how would they explain the sudden increase of this invisible and indetectable gas in the past 100 years or so ? Thank you for this post. Evans & co have engaged in an impressive exercise of unphysical chartism with some fine tuning and hubris ("Force X") for good measure. An illustration of this is provided by their claims about nuclear tests. Apart from dust absorption there is no plausible mechanism. Their statement "it’s radioactive too (a bit of a cosmic ray effect?)" seems apologetic rather than invoking a plausible mechanism. Mythical forces always come in pairs, gremlns are not enough. From Open Mind a while ago. gremlins create magic warming that happens to be same size as CO2′s. leprechauns nullify effects of CO2, to avoid doubling"
One always needs the leprechauns to have some reason to ignore Greenhouse Effect without plunging into Slayer turf. See Who is 'Rocket Scientist' David Evans? and make sure to read the comments. Bragging about making a word processor is pretty great (though debunking it by calling up MS is nonsense -- what's silly is the claim that a one-man effort will get anywhere). Sounds like someone with serious delusions of grandeur. Anyone with a PhD in a technical field is a rocket scientist, eh? I'm sure my various acquaintances with such degrees would be thrilled to learn they had earned such a qualification without even noticing it. What a classic crank this guy Evans is, and how silly and credulous Jo looks (again) to be trumpeting his nonsense in her blog. When this latest great "death of AGW" piffle blows away in a year our so, I hope William Conneley and the other few sane voices willing to subject themselves to that loony bin will keep reminding her acolytes of how easily they fell for it. "no empirical science indicating a major cause other than CO2 for climate change will be published in any climate journal." What empirical evidence? They have postulated the existence of hitherto undetected and unmeasured, physics defying 'Nova particles'. Newsflash. That's not empirical evidence. Talk about grand conspiracy theories. It does show that ideology can trump reality, and that those obsessed with 'ABCD' (anything but carbon dioxide) will come up with any old codswallop to feed their Morton's daemon. Like, we all know that the pot boils as soon as you turn on the stove top, and returns to room temp as soon as you turn it off... DUH. Like, we all were very critical of the "deep ocean heat sink" theory that explains 20 years of global cooling in the midst of AGW, right?